"You can overcome anything short of death." 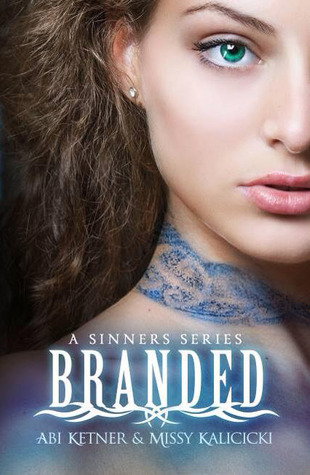 Branded was a great first book for the sinners series. It was written by two amazingly talented ladies, Abi Ketner and Missy Kalicicki. They are exceedingly nice and truly care about their fans, enough to create an Anti-bullying account on instagram. I actually won a signed version of this book from a giveaway on instagram and I will treasure it forever. There are so many things about this book that I love, I don't know if I'll be able to write it all down but I'll try. First of all I love dystopian books because it makes me appreciate the reality I live in, sometimes. I love that it was based on the seven deadly sins because that's not something I've ever read in this way before. I really liked the sins concept; it made me extremely glad the world isn't really like that because I -like most everyone else- would have a rainbow on their necks. Lexi Hamilton was falsely accused of being a sinner, so she was taken to live in the Hole with the rest of the sinners. She was branded with a blue brand, which means lust. In this world that means she is labeled a whore by anyone that sees her blue brand. Cole is assigned to be her guard and to protect her at all costs. After spending a lot of time together they start to get feelings for each other. Which is against the rules and punishable by torture and death. They have to fight for their lives to escape the Hole but that will not be easy. I want to be Lexi Hamilton when I grow up, minus the whole being branded with lust thing. She was very strong willed and learned how to hold her own when her world was beating her down. Cole was another favorite because who doesn't love a hot guy forced to protect you? Of course, their contact was forced at first but naturally they fell for each other and it was the sweetest thing. I also liked Sutton, Alyssa, Bruno and Zeus. Hands down Zeus was my favorite being in this whole book, I want my own Zeus in my life! There were a few characters that I wouldn't mind punching in the throat, like Wilson, I really didn't like that guy. At first I didn't like Keegan because he got in the way of Cole and Lexi but I understand why, I guess. I know he was just trying to be a good big brother and protect his little sister.